1987 SAN MARINO - Biennale d'Arte a San Marino (Cat. Unif/Sassone N° 1201/1202 - Yvert. N°1164/1165) Serie completa di 2 valori Nuovi gomma integra originale in quartine. 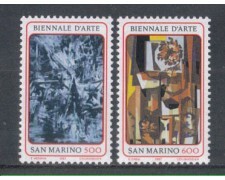 1987 SAN MARINO - Art Biennale - Complete Series 2 new values - Block of Four - Complete original gum - Never Hinged. 1987 SAN MARINO - Aerei Ultraleggeri (Cat. Unif/Sassone N° 1200 - Yvert. N°1163) Francobollo Nuovo gomma integra originale in quartina. 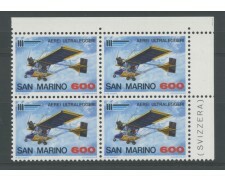 1987 SAN MARINO - Ultralight Aircraft - Block of four - Complete original gum - Never hinged. 1987 SAN MARINO - Europa Architettura Moderna (Cat. Unificato N° 1195/1196 - Yvert. N°1148/1149) serie completa di 2 valori nuovi gomma integra originale in quartine. 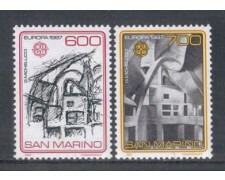 SAN MARINO 1987 - Europe Modern Architecture series of 2 new values - Block of four - original gum - Never hinged. 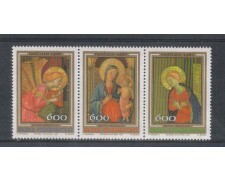 1987 - SAN MARINO - NATALE 6° CENTENARIO DELLA NASCITA DEL BEATO ANGELICO (UNIF.SASS.1218/1220 - Yvert. 1171/1173) TRITTICO NUOVO GOMMA INTEGRA ORIGINALE. 1987 - SAN MARINO - " HAFNIA 87" ESPOSIZIONE FILATELICA INTERNAZIONALE" VEDUTE DI COPENAGHEN (UNIF.SASS. 1216/1217 - Yvert.1169/1170 ) SERIE COMPLETA 2v. NUOVI GOMMA INTEGRA ORIGINALE - UNITI. 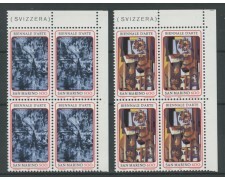 1987 SAN MARINO - Philatelic Exhibition "Hafnia 87" complete set of 2 new values - Complete original gum - Never Hinged. 1987 - SAN MARINO - "L'UOMO E LA SOCIETA'" LA NON VIOLENZA (UNIF/SASS.1215 - Yvert. 1166) NUOVO GOMMA INTEGRA ORIGINALE. 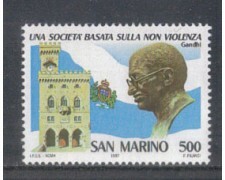 1987 San Marino - Man and society '"Nonviolence" new stamp MNH. 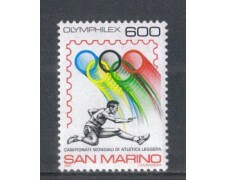 1987 - SAN MARINO - CAMPIONATI DI ATLETICA LEGGERA ED ESPOSIZIONE FILATELICA (UNIF/SASS.1214 - Yvert. 1167) NUOVO GOMMA INTEGRA ORIGINALE. 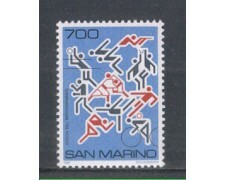 1987 - SAN MARINO - GIOCHI DEL MEDITERRANEO (UNIF/SASS.1213 - Yvert. 1168) NUOVO GOMMA INTEGRA ORIGINALE. 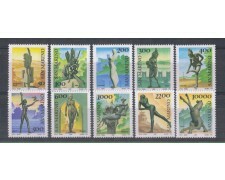 1987 San Marino - Mediterranean Games - new MNH. 1987 - SAN MARINO - MUSEO ALL'APERTO SCULTURE (UNIF.SASS.1203/1212) SERIE COMPLETA 10v. NUOVI GOMMA INTEGRA ORIGINALE. 1987 - SAN MARINO - 7° BIENNALE D'ARTE (UNIF.SASS.1201/1202 - YVERT. 1164/1165) SERIE COMPLETA 2v. NUOVI GOMMA INTEGRA ORIGINALE. 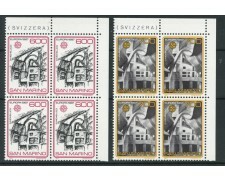 1987 SAN MARINO - Art Biennale - Complete Series 2 new values - Complete original gum - Never hinged. 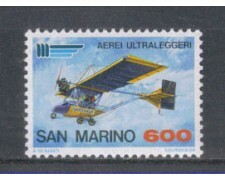 1987 - SAN MARINO - AEREI ULTRALEGGERI (UNIF/SASS.1200 Yvert. 1163 ) NUOVO GOMMA INTEGRA ORIGINALE. 1987 - SAN MARINO - GRANDI COMPETIZIONI AUTOMOBILISTICHE (UNIF.SASS.1197/1199 - YVERT. 1150/1152) SERIE COMPLETA 3v. NUOVI GOMMA INTEGRA ORIGINALE. 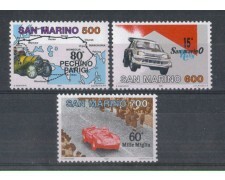 1987 SAN MARINO - Large car racing complete set of 3 new values - original gum - Never Hinged. 1987 - SAN MARINO - EUROPA - ARCHITETTURA MODERNA (UNIF.SASS. 1195/1196 - YVERT. 1148/1149) SERIE COMPLETA 2v. NUOVI GOMMA INTEGRA ORIGINALE. 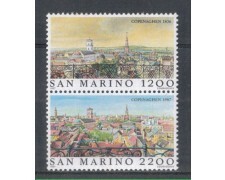 SAN MARINO 1987 - Europe Modern Architecture complete series of 2 new values - original gum - Never Hinged.